Nowadays many people are learning German on their own and one problem they face is to keep a schedule of their learning and/ or to keep track of what they have learned. 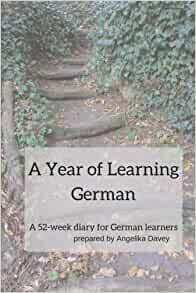 This journal has been designed to give those learners a whole year of learning German.This undated 52-week diary can be started at any time. It has a short planner for 12 months followed by 52 weeks of detailed planning/ learning. Each week has two pages. Page one is for keeping track of what has been learned. Page two has space for reflecting what went well and what might need more practice. There is also a short space for next week's ideas. At the end of each week there is a German idiom with translation just for fun or for a challenge of using it the following week. I bought this journal to keep a record of my German learning activities and keep track of what is and isn't working for me. I have been using it for almost three weeks and am loving it! The journal is completely undated. If I miss a day, or even a week, I can just pick up where I left off. No guilt! It starts with some helpful tips and ideas from the author and then there is a short monthly planning section. The rest of the journal is comprised of two page weekly spreads with the perfect amount of structure, but space to make it personal. It's simple and to the point and well put together. There is an idiom at the end of each weekly spread which adds a nice dimension--I am integrating it into my learning and am enjoying it! The only thing that I would change is the paper quality. It is sufficient, but a slightly heavier paper would be nice. For anyone who cares about this sort of thing, I am using a Pigma Micron 005 and it shows through a little, but no bleed through. All in all, I'm super happy with my purchase and plan to buy it again! It is a strange book that is completely blank!